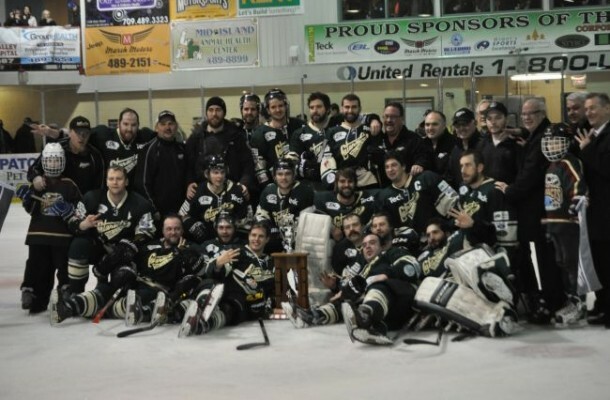 The Grand Falls-Windsor Cataracts won the Central West Senior Hockey League title with a 9-2 trouncing of the Corner Brook Royals. The Cataracts take the series 4-1 on home ice at the Joe Byrne Arena. The Cataracts jumped out to an early 1-0 lead in the first period when Andre Gill scored on a goal assisted by Steve Yetman and Brandon Bussey at the 6:21 mark. Just over 5 minutes later, the Cataracts jumped out 2-0 when Greg Hoffe scored. The Royals pulled to within a single goal when Scott Doody scored late in the first period at the 19:05 mark, making the score 2-1 after one period of play. The Cataracts exploded in the second period scoring 6 unanswered goals. Danny Wicks and Alex Dalley scored twice, with Brandon Bussey and Steve Yetman adding single markers in the period. Bussey would score again in the third period making it 9-1. The Royals scored late in the third period to make it 9-2. The Cataracts dominated the game, out shooting the Corner Brook Royals 19-9 in the first period, 20-4 in the second period and 8-6 in the third period. The Royals could only muster 19 shots throughout the game, with the Cataracts peppered the Royals goalies with 47 shots. With the win, the Cataracts take their third straight title.